Sir Nathaniel Johnson was commissioned on June 18, 1702 as the next governor of Carolina, but he did not arrive in Charles Town and take the oaths of office and allegiance until March of 1703. He was governor until November 26, 1709. Click Here to read the Commission and Instructions provided by the Lords Proprietors to Governor Sir Nathaniel Johnson. Sir Nathaniel Johnson, governor of Carolina, was born in 1644 and he died in 1713. He had been in the British army, served as a Member of Parliament, and between 1686 and 1689 was governor of Treves, St. Christopher, Montserrat, and Antigua. In 1703-1709, he was Governor at Charles Town, and during the French attack on that colony in 1702 defeated the enemy, with the loss of their commander and 300 men. Sir Nathaniel Johnson introduced silk-culture into the province in 1703, and is said to have been the pioneer of that industry here. Sir Nathaniel Johnson of Kibblesworth, County Durham, was Governor of the Leeward Islands in 1686 and of Carolina in 1703-1709. He established the Parish system in South Carolina and was active in defending the colony against the Spanish and French. 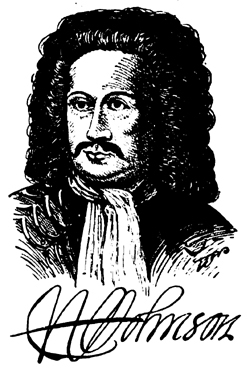 He was created a Cacique in 1686 and a Landgrave in 1702. A son, Robert, was Governor of South Carolina and left descendants in America and England. A daughter, Ann, married Lt. Governor Thomas Broughton and has many descendants in South Carolina. 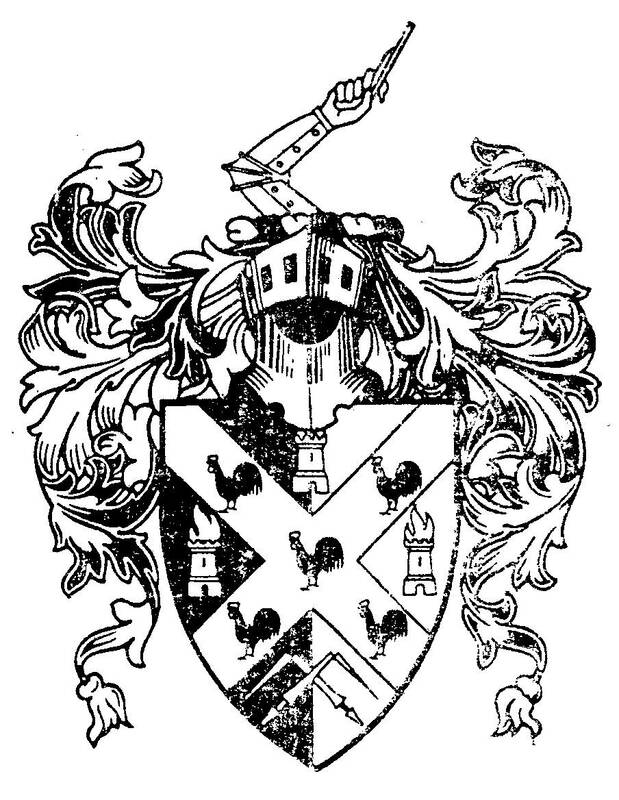 Johnson's coat-of-arms granted to an ancestor in 1569 (above), is shown on his portrait which hangs with that of his wife in the Gibbes Art Gallery in present-day Charleston. Sir Nathaniel Johnson became governor in 1703, and trouble immediately began. His first act was to have a law passed by sharp practice excluding all Dissenters, who composed two-thirds of the population, from the Commons House of Assembly. The people discovered the trick, and the next Commons House of Assembly voted by a large majority to repeal the law. But Johnson refused to sign their Act. The Commons House of Assembly then appealed to the Lords Proprietors, but they sustained the bigoted governor. The people then appealed to the House of Lords and won their case. The Lords Proprietors yielded when the Act of their governor met a Royal veto from Queen Anne and when threatened with the loss of their charter, and the Dissenters restored to their share in the government. The Church of England, however, was made the official state church and so it continued until the time of the American Revolution. The colony was divided into parishes, which became political, as well as ecclesiastical, divisions. At the beginning of his government, however, Sir Nathaniel Johnson gave his sanction to a blow at the Spanish interest which reaped a larger measure of success than any other military enterprise of the war, and which was definitely directed against Louisiana as well as Florida: the Apalachee expedition of 1704. In 1702 and 1703, the progress which the French were making among the Alabama and Talapoosa, and more especially the potential danger to the "Coweta" (Kawita) and Yamassee, revealed by the abortive Spanish-Apalachee attack of 1702, awakened anxiety among the Carolinians for the stability of their Indian system. A general movement northward of the tribes which composed the bulwark of the province seemed imminent. Measures to protect these Indians and to confirm them in the places in which they lived repeatedly engaged the attention of the government. It was at length determined, at the solicitation of the Commons House of Assembly, to dispatch a force of a thousand friendly Indians and fifty whites under the recent Col. James Moore, Jr. to assist the Kawita by attacking the Spanish frontier province of Apalachee. On January 14, 1704, Col. James Moore, Jr. successfully stormed the first and strongest fort, at Ayubale. The invaders then captured one post after another until the rich province with its flourishing missions was almost completely ravaged and subdued. Besides many Indians killed in battle, or carried away as slaves, three hundred men and a thousand women and children who had submitted were persuaded to remove to the neighborhood of Savannah Town to strengthen the immediate frontier of South Carolina. By this energetic proceeding Col. Moore destroyed the chief weapon upon which the Spanish and French had relied for offensive action against Carolina, before it could be made really effective. "Before this Expedition," Col. Moore informed the Lords Proprietors, "we were more afraid of the Spaniards of Apalatchee and their Indians in Conjunction with the French of Mississippi, and their Indians doing us Harm by Land, than of any Forces of the Enemy by Sea. This has wholly disabled them from attempting anything against Us by Land." The immediate consequence of the new security against inland assault was an increased activity of Carolinians on the Louisiana frontier. Already the Charles Town traders, with the aid of Acting Governor James Moore's government, had undermined the weakest support of Iberville's structure of alliances, the friendly understanding with the Alabama Indians. It had early been recognized by the English that the amity of the tribes seated at the forks of the Alabama was essential to the western expansion of their trade; and between 1701 and 1703 efforts had been put forth to counteract the advantage enjoyed by the French in their control of the water-routes. An effect had soon been produced. In May of 1703, the French traders had been waylaid and murdered by the Alabama. The hostilities thus begun continued nine years. Punitive expeditions from Mobile accomplished little; somewhat more effective were the attacks of the French Indians spurred on by liberal offers of reward for scalps and captives. Meanwhile, the Alabama war greatly facilitated the work of the South Carolina traders, who, on the farthest frontier of the English colonies, advanced hand-in-hand their own profit and the political interests of their province. About the same time Philip Ludwell, a gentleman from Virginia, being appointed governor of Carolina, arrived in the province. Sir Nathaniel Johnson, who had been general of the Leeward Islands in the reign of King James II, being created a Cacique of Carolina, after the Revolution retired to that country, and took his seat as a member of the Executive Council. On June 18,1702, Sir Nathaniel Johnson received a commission from John Grenville, 1st Baron of Granville of Potheride and Palatine over the Lords Proprietors, investing him with the government of Carolina, to which office a salary of two hundred pounds was annexed, to be paid annually by the Receiver General of the colony. This gentleman had not only been bred a soldier from his youth, but had been also a member of the House of Commons, and was well qualified for the trust. But it being suspected that he was no friend to the Revolution, the Lords Proprietors could not obtain her majesty's [Queen Anne] approbation of him, but on the following terms: That he qualify himself for the office in such a manner as the laws of England required; that he give security for his observing the laws of trade and navigation, and obey such instructions as should be sent out from time to time by her majesty; and the Lords Commissioners of trade and plantations were ordered to take care that good and sufficient security be given by him. Sir Nathaniel Johnson looked upon Dissenters of every denomination as enemies to the constitutions of both church and state, and therefore, to subvert their power and influence, or compel them to uniformity of sentiment, another bill was brought into the Commons House of Assembly, framed in such a manner as to exclude them entirely from this house of representatives. This bill required every man who should hereafter be chosen a member of the Commons House of Assembly, to take the oaths and subscribe the declaration appointed by it, to conform to the religion and worship of the Church of England, and to receive the sacrament of our Lord's Supper, according to the rites and usage of that church; a qualification which Dissenters considered as having a manifest tendency to rob them of all their civil rights or religious liberties. To carry this bill through the house, all the art and influence of the governor and his party were requisite. In the lower house it passed by a majority of one vote, and in the upper house Landgrave Joseph Morton (and former governor) was refused liberty to enter his protest against it. At this juncture no bill could have been framed more inconsistent with the rights and privileges of the freemen, and more pernicious to the interest and prosperity of the country. Dissenters, who were a numerous and powerful body of the people, were highly offended, and raised a great outcry against it. Seeing themselves reduced to the necessity of receiving laws from men whose principles of civil and ecclesiastical government they abhorred, and subjected to greater hardships than they suffered in England, many had formed resolutions of abandoning the colony. Loud clamours were not only heard without doors, but jealousies and discontent filled the hearts of many within them, not of Dissenters only, but also of those who adhered to the church. In this distracted state of the colony, the inhabitants of Colleton County, composed chiefly of Dissenters, met and drew up a state of their grievous circumstances, which they resolved to transmit to the Lords Proprietors, praying their Lordships to repeal this oppressive act. John Ash, one of the most zealous men in the opposition, agreed to embark for England as agent for the aggrieved party, computed to be at least two-thirds of the whole inhabitants of the colony. The governor and his friends, apprised of this design, used all possible means to prevent him from obtaining a passage in any ship belonging to Carolina. Upon which John Ash went to Virginia, to which province his instructions were conveyed to him, and from thence he set sail for England. Sir Nathaniel Johnson having advanced so far, was determined to proceed in spite of every obstacle thrown in his way. He instituted what the inhabitants of Carolina took to be a high-commission court, like that of King James II. It was enacted, that twenty lay-persons be constituted a corporation for the exercise of ecclesiastical jurisdiction, with full power to deprive ministers of their livings at pleasure, not for immorality only, but also for imprudence, or on account of unreasonable prejudices taken against them. About the end of the year 1708, Col. Edward Tynte received a commission from William Craven, 2nd Baron Craven and Palatine over the Lords Proprietors investing him with the government of the colony. About the same time Charles Craven, brother to the Palatine, was made Secretary to the province. During the time Sir Nathaniel Johnson had governed the country, it had not only been threatened with a formidable invasion, but also torn to pieces with factions and divisions, which had much retarded its progress and improvement. Great confusion among the people had been occasioned by the violent stretch of power in favor of an ecclesiastical establishment. In 1708, Governor Nathaniel Johnson reported a slave majority for the first time in South Carolina. African Slaves - 4,100, Indian Slaves - 1,400, Whites - 4,080, Total - 9,580. Until 1715, the English controlled the trade of the Lower Creeks. During his term, Governor Nathaniel Johnson showed a keen realization of the importance of their trade when he declared in an official report that the Cherokee were "a numerous people but very Lasey," and their trade inconsiderable in comparison with the flourishing southern and western trade of the Creeks who were described as "Great Hunters and Warriors and consume great quantity of English Goods." Fort Johnson, later to be associated indelibly in the minds of colonial South Carolinians with liberty, was named in honor of a determined and aggressive English aristocrat. Sir Nathaniel Johnson was governor of the colony during one of its many times of tribulation in the proprietary period. War impended between the British and the Spanish, whose powerful fortress at St. Augustine seemed to menace the very existence of the Carolinas. Accordingly, in order to make the harbor more secure against expected enemy invasions, Governor Johnson ordered the erection of a strong point on the exposed neck of land which projected into Charles Town harbor and thereby dominated it. The year was 1704, Fort Johnson's history since that time has been as continuous and traceable, if not as striking and dramatic, as that of Fort Sumter. The history of Charleston may well have turned out differently had it not been for one unassuming little building. The Old Powder Magazine was built in response to a recommendation by Sir Nathaniel Johnson, colonial governor of South Carolina (1644-1713), who declared, "A magazine for your stores of powder bullett and other warlike tooles necessary is greatly wanting." Click Here for information on the Executive Council under Governor Nathaniel Johnson. << Last Governor - James Moore, Sr.